Being a mom is wonderful, right?! It’s just the everyday mothering tasks that, if we’re not careful, can slowly eat us alive. Whining, up-all-night feedings, lingering illnesses, ongoing discipline issues, endless homework, and all that time in the car: Everyday motherhood is downright relentless. How can we deal with the hectic, perpetual pace of raising kids and running a home? Here are 4 things I’ve learned on how to manage motherhood’s relentless pace. Tip #1: Have a Stopping Point. True, we can’t ever completely take off our mothering hat (unless we magically get transported to a desert island for six weeks or something) but it’s critical that we build in breaks and boundaries. Establish regular times (and yes, you have to schedule it) where you are not feeding, wiping, carrying, or otherwise taking care of a little person’s needs. Yes, I know this is hard to do. Yes, it takes a little creativity and some out of the box thinking. But here’s what’s a stake if you don’t do it: your anger level, your sanity and maybe even your self-worth. What can a “stopping point” look like? Making the most of nap times (or encouraging a quiet afternoon play time if your kids are too old to nap. Establishing a morning routine where you can spend a few quiet moments to yourself (exercising, reading, praying—whatever fills you up). Taking a 15 minute walk a few times a week (yes even up and down your street if need be). A regularly scheduled phone call with a friend (go into the other room and shut the door). Regular date nights (you’ve got to get this resource for great ideas!) with your husband or significant other (when you don’t talk about the kids!). Longer weekend breaks a few times a year, either by yourself (grab an inexpensive local hotel room) or with your husband or a friend. We often try to sabotage our own rest, don’t we? I definitely do. Isaiah 30:15: This is what the Sovereign Lord, the Holy One of Israel, says: “Only in returning to me and resting in me will you be saved. In quietness and confidence is your strength. But you would have none of it. It really is OK to stop and rest. Really. (I’m telling myself as much as I’m telling you!). Tip #2: Keep a 5-Year or 10-Year Perspective. On the most hectic parenting days where I am worn out and completely frustrated, I play a little math game. You can play it too (I promise it’s not painful). Ready? I simply add 5 or 10 years to my children’s ages and think about what life will be like then. I don’t dream about the future in a fantasy sort of way. Those days will have their own unique set of trials and burdens, right? I won’t always have kids in diapers. My son won’t always want me to read him a story and sing him songs at night. My older kids won’t always be available to run a quick errand with me. These truths ground me and give me endurance on those days when I am sure that things will never ever change. Tip #3: Catch the (anger) foxes. While this verse is specifically talking about marriage, there are so many applications here to motherhood! What habits do we continue to allow in our daily mothering that make it that much more difficult? 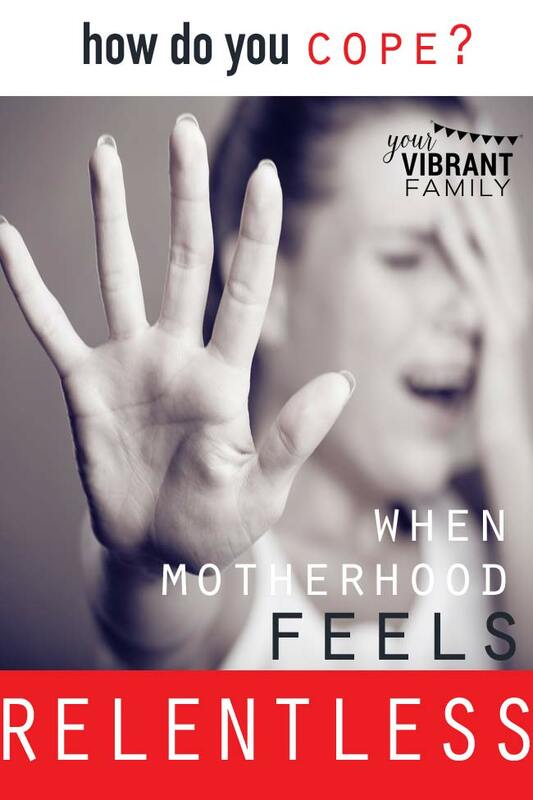 Mommy anger was one that tripped me up for a long time and made motherhood very challenging. It quickly turned my already relentless pace into a joyless, guilt-ridden one. I felt extremely alone and worn out from anger vicious cycle. It was only when I learned the powerful tools and came up with an action plan to change (both found in the “7 Days to a Less Angry Mom” course) that I felt motherhood’s relentless pace relax. Why am I singling out mommy anger as the biggest “fox” to catch? 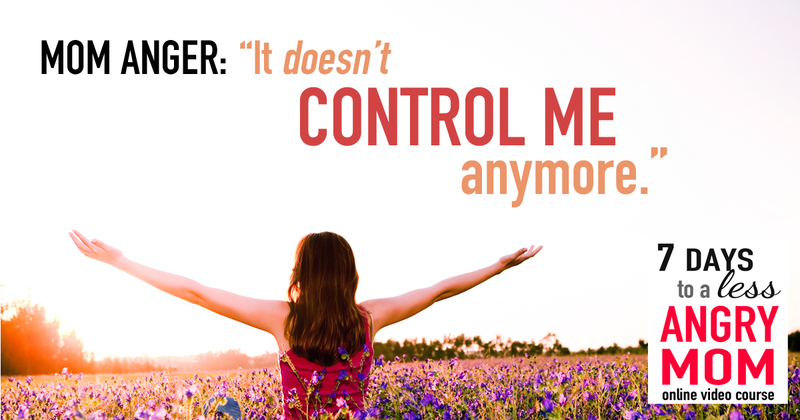 Anger it cripples us, forcing us to carry an even weightier burden than we were ever expected to carry as moms. Anger hurts our relationships and damages our own psyche. And every single mom deals with it! That’s right, all of us! 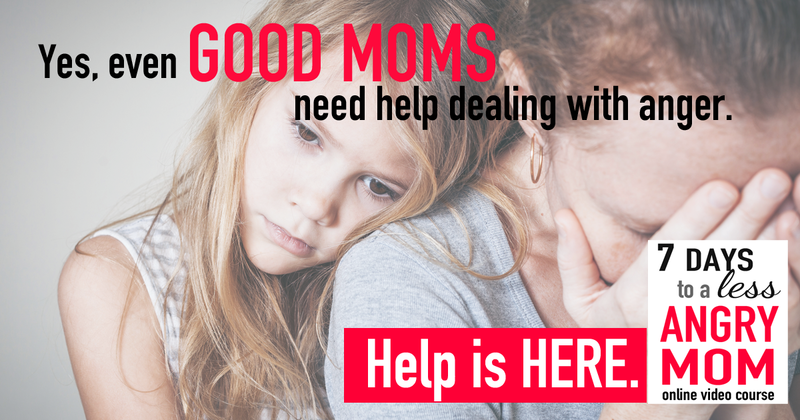 If you feel at all trapped by mommy anger, please join us in the “7 Days to a Less Angry Mom” course! This collection of 7 powerful videos, 50 pages of innovative homework activities and a private Facebook group (for accountability and encouragement) is bringing healing to hundreds of women across the world, and we’d love to have you join us! Tip #4: Stop Expecting Perfection. This was an epiphany for me last year. I found myself mired in the quicksand of “destination sickness” thinking (you know—where you think that life will finally be happier when you reach that one parenting stage or this one great thing happens?). Destination sickness is kind of like chasing that mirage in the desert: We’re chasing a fantasy that doesn’t exist. Motherhood’s relentless pace will wax and wane, but it will always be there. Ladies, we must stop holding our breath and waiting for “that day” or “that moment” to come in order to fully embrace and enjoy our mothering journey. P.S. If you want to find freedom from mommy anger too, I highly encourage you to check out the “7 Days to a Less Angry Mom” course here!